There’s no doubt that Saturday was the perfect day for a bushfire in the Wide Bay and by now you will have heard of the size of the fire at Sunshine Acres. 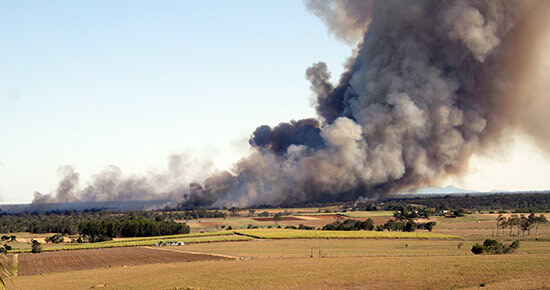 It certainly looked spectacular from Ghost Hill in Hervey Bay and flames were visible at times. However this wasn’t the only fire burning between Hervey Bay and Childers. In this next photo you can see the start of a fire that broke out to the east of Howard and if you were travelling back from Childers you would have seen smoke from a third fire that was burning on the western side of the Bruce Highway. While the fire east of Howard doesn’t look all that significant in this photo it did seem to grow in size a little later in the day. Fraser Coast Regional Council Does It Again!